It’s time for another round of Weekly Shonen Jump character roster reveals. Thank goodness Bandai Namco has multiple fighting games in the works! This time, a couple of new My Hero One’s Justice characters have been revealed. Both Gran Torino and Muscular (voiced by Kenichi Ogata and Kousuke Takaguchi respectively) are the latest additions to the roster, which is getting pretty stacked. Gran Torino’s Quirk (in-universe word for powers), revolves around shooting air from his feet. He uses that ability to fly, and speed is a big part of his gameplay. Muscular’s Quirk is the ability to control his muscles. Pretty self-explanatory, right? He’s definitely a bruiser type, augmenting his muscle mass for huge, singular blows. In the My Hero Academia story, Gran Torino is introduced in the series’ second storyline, as a mentor-type character to teach protagonist Deku to control his Quirk. He was also All-Might’s teacher in the past, and becomes a regular part of the story following his introduction. Muscular is a villain, who straight-up has no qualms about killing people. He joins the League of Villains’ Vanguard Action Squad, and is a big part of the “Forest Training Camp” storyline. He serves as almost an evil parallel to Deku as their powers are similar (big punching). 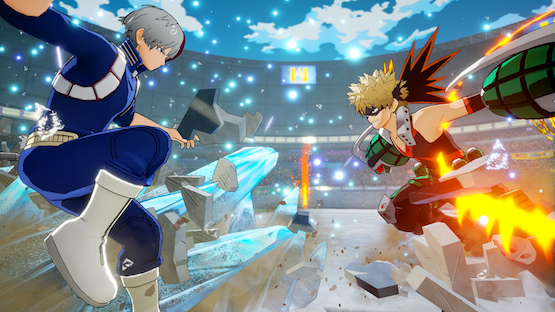 My Hero One’s Justice is set to release this October (no day yet) for PlayStation 4 and Nintendo Switch.